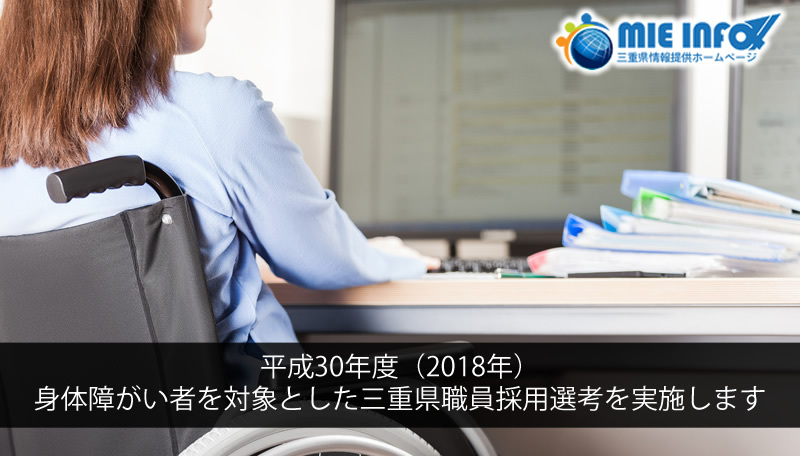 In accordance with the purpose of the Act on Promotion of Employment of Persons with Disabilities, the Mie prefecture official recruitment selection for people with disabilities will be implemented to promote employment for disabled people living in Mie Prefecture. General Administrative Field General Affairs 4 Positions Engaging in general affairs at the Governor’s Office, Board of Education, Enterprise Agency, Hospital Administration Agency etc. Must be able to perform their duties as general clerk without a care giver. (As a general rule, the weekly workload is 38 hours and 45 minutes and daily workload is 7 hours and 45 minutes). Possess the physical disabled card, degree between 1 to 6. Applicants must have been born between April 2, 1984 and April 1, 2001. Must be a resident of Mie Prefecture (in exception for those living temporally out of Mie Prefecture due to studies or other reason). Must be able to apply through printed communication. It is possible to carry out the test in Braille (Can use audio PC as auxiliary). Those who do not fall under the disqualification clause of Article 16 of Local Public Service Law. Those who do not have Japanese nationality can also apply, but they do not correspond to foreign languages. *Application via Internet is until the afternoon of September 21 (Friday). If you are using the Internet, as much as possible please apply using the Internet. Apply now for child care options starting April 2019 The Yokoyama Tenku Cafe Terrace in Ise Shima Kokuritsu Koen is now open!